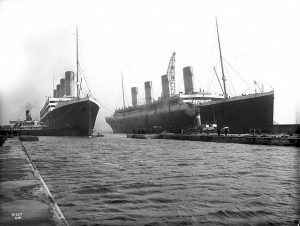 March 6, 1912: Titanic (right) had to be moved out of the drydock so her sister Olympic (left), which had lost a propeller, could have it replaced. If you have studied Titanic long enough, you are sure to come across various conspiracy theories. They vary from the supernatural (mummy curse) to the exotic (the Iluminati). And some that are even a stretch for conspiracy theorists to wrap around (like time travel or German submarine sinking Titanic). Then there is the switch theory. What is the switch theory? That White Star switched the ships so that the actual ship that sank was Olympic not Titanic. The reason varies on who is making the claim. Some years ago Robin Gardiner made the claim in his book Titanic:The Ship That Never Sank? that it was done so that White Star could collect damages on the new ship. The underlying reason for the switch is the HMS Hawke collided with Olympic in 1911. Olympic was determined to be at fault and Lloyd’s of London refused to pay the claim to White Star. So they decided to switch ships and sink Titanic to claim insurance. Of course the planned sinking went awry and you know the rest. The book is still out there and has some believers on You Tube and elsewhere repeating it as fact to this day. Enter into the fray Myles Power who decided to take on this claim on his YouTube channel. And it certainly has gotten a lot of interest as newspapers like the Daily Star reporting on it. Power spends a lot of time going through the claim and debunking it. At last check it had over 37,000 views and growing. I read the book when it first came out and shook my head after I closed the last page. It ought to have been an alternative history book. He is not the first nor likely the last that has come up with wildly speculative (and sometimes entertaining) conspiracy theories. In the age of the Internet though, Gardiner is finding that his claims can be debunked for the whole world to see. No word from Gardiner on what he thinks about all of this. He is probably hoping you will spend money at Amazon to buy his book. Check out your local library and see if you can check it out for free. FYI: Here is a post I did back in 2014 that goes through many of the various theories about Titanic sinking including the conspiracy and supernatural ones.